Volunteer with local community initiatives Ecuador is a multiethnic and multicultural nation of 14 million people, mixture of influences from Spanish conquerors, with the ancestral traditions of pre-Columbian people; here, 14 nationalities and 20 indigenous tows inhabit and 10 different languages are spoken, making of Ecuador a country rich in culture, traditions, ancestral legacies and languages, which manifest themselves in all aspects of daily life. When choosing to participate in one of our projects, you’ll not only be helping to alleviate poverty, enhance educational levels or give love to an orphan kid; you’ll be sharing your life and being with other people and, in return, you’ll become part of their lives, sharing their culture, traditions and customs. If your purpose is to get involved in a project where you can get to know the culture and the people in depth, our projects provide you the best opportunities to reach your goals with a meaningful experience. Find out more about your volunteer/internship options here. Volunteer on projects working to protect the environment and wildlife living in Ecuador’s megadiverse biosystems Ecuador is one of the 17th most biodiverse countries of the world, located in the northwestern part of South America, crossed by two of what scientists call “biodiversity hotspots” of the world, due to their unusual levels of diversity and species endemism: Tumbez Choco Magdalena coastal Forests and the Tropical Andes. Ecuador also has a National System of Protected Areas, composed of 47 protected areas that represent 19% of the total area of the country, including the Galapagos Islands. This is the essence of the adventure that is waiting for you; while learning, you will be able to inmerse yourself into nature and enjoy the beauty of what is surrounding you. Projects in agroforestry and agroecology, conservation, environmental education, animal protection and rehabilitation, among others, are waiting for you. View Environment and conservation projects here. Volunteer in business-related roles around Ecuador Ecuador has everything to offer to people seeking to learn and apply their knowledge in the business area. There has been a boom of projects and industries in the country within the past years; numbers show that Ecuador’s growth has been stable and good, expecting to grow at 5% on 2015. Also, living conditions in urban, but especially in rural areas, have improved. An important part of this is due to the initiatives that are held in different communities within the country, which seek to reach a sustainable development for their own population, improving their living conditions and alleviating poverty using their knowledge, technics and skills, and that has been passed from generation to generation, but that now has become a new source of income. Be part of this experience assisting community members, helping them look for potential markets, use technological tools, learn about the insights of an NGO, always with the belief that service to society is the mainstay on which a productive and happy community is based. Find out more about your volunteer options here. Volunteer with dance, music and art initiatives in Ecuador If you are a studying or know about music, dance, photography, illustration, graphic design, drawing and/or painting, you could immerse yourself in projects related with Ecuadorian Andean landscapes paintings, children and other Ecuadorian thematic designs, as well as travelling through Ecuador taking pictures of its nature, animals, vegetation, texture or even teaching art and photography. There are also programs focused on social aspects, such as enhancing the cognitive aspects of kids and young adults with special needs through plastic arts, dance and music; where you will find out that nothing is as satisfying as being able to receive a selfless smile or a fraternal embrace at the end of the day. Find out more about your volunteer options here. Volunteer within various aspects of Ecuador’s Health system Get the opportunity to shadow doctors, learn all about the specialty you are interested in, assist in emergency care, interact with patients, take their vital signs, help in ambulances, assist in research projects, learn about first aid, give workshops in English to students and many more through the health projects we have to offer. You can also choose to stay in Quito at regular hospitals or clinics or go to rural areas with a mobile clinic and provide health services and workshops to indigenous communities. Find out more about your volunteer options here. Volunteer within education projects in Ecuador Education in Ecuador has experienced a strong growth with significant achievements such as reducing adult illiteracy and the incorporation of more children in the school system, particularly from the poor segments of society. There is now greater equality in access and retention by groups traditionally marginalized in education such as women, indigenous groups and individuals with special needs. By working in these projects, you will have the opportunity to interact with Ecuadorian people of all ages, understanding their concerns, interests, ways of looking at the world, as well as improve your public speaking skills and strengthen your vocation as an educator; but, most important, you will have the opportunity to provide others with one of the strongest tools to eradicate poverty: education. Your knowledge can be applied in different areas such as English, math, computer sciences, environment and many more. Find out more about your volunteer options here. 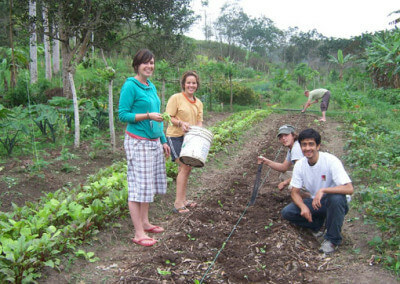 Volunteer in Ecuador on one of our many fantastic projects!